Throwing a party and need just the perfect drinking glasses? If yes, don't worry! We have you covered! Check out all of the varieties of Specialty Glasses that we offer. We carry different designs and patterns of your well know drinking glass styles. From hurricane glasses to margarita, champagne to wine, we have your glass covered! We offer neon colors, character glasses, and even party goblets. Don't get boring plastic cups from the store when you can get exciting specialty cups right here! Your party guests and family will be begging you to tell them just where you got such cool and colorful drink ware! Instantly feel like you've transported to a tropical island by sipping a frozen drink out of one of our Coconut Cups! It's sure to make your drink taste even better! 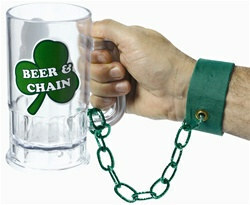 So no matter what kind of specialty cups you're looking for we've got you covered right here at PartyCheap.com! Serve your party guests with theme matching glasses. Our Specialty Glasses don't just come in different styles, they are also fit for different themes! Whether your hosting a luau party and prefer margarita glasses or your throwing an Italian night party and prefer wine glasses, we have what you are looking for. We have a variety of fun glasses that would be great to send home with your guests as the party favors! Check out our full line of Specialty Glasses and find the style and theme that is perfect for you!